The British Embassy in Mogadishu worked with AMISOM and advisers from the Federal Government of Somalia to develop training content to prevent use of child soldiers. The UK has funded a training course on the prevention of the recruitment and use of children in armed conflict, delivered by Somalis to their fellow countrymen. The three day course brought together 60 participants from the Federal Government of Somalia, Federal Member States and Somali Security Sector. This was the first time a UK-funded “training of trainers” course was delivered by Somali trainers. The British Embassy in Mogadishu worked with African Union Mission in Somalia (AMISOM) and advisers from the Federal Government of Somalia to develop content and to empower Somali trainers to deliver training to other Somalis. The recruitment and use of children in conflict is a vile practice and a threat to lasting peace in Somalia but more and more Somalis are stepping forward to tackle the problem. The UK is proud to be empowering them to train fellow Somalis in the skills and understanding needed to build a future in which no Somali child ever has to carry a gun. Somalia’s long conflict has witnessed much recruitment and use of child soldiers. Robust training, outreach and advocacy are key to ending this and achieving compliance with international laws. Working with Somali Security Forces is an important first step as they are the first point of contact with children associated with armed conflict. The participants and facilitators approached the training with enthusiasm and demonstrated a high level of commitment to serve as ambassadors to eradicate the use of child soldiers and promote children’s rights throughout Somalia. Previous training courses have been delivered in Somalia, but never before with Somalis running the training. The training methodology and course content were developed by the Romeo Dallaire Child Soldiers Initiative and managed by the AMISOM Child Protection Office. The initiative is a good example of collaboration and coordination between the African Union, British Embassy Mogadishu and the Federal Government of Somalia. It is a significant development to see Somalis training their own. This is an indication of the tangible progress made towards improving the mainstreaming of child protection across Somalia. 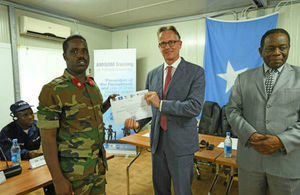 We are looking forward to witnessing the integration of child protection training for the Somalia Security Forces. Thirty of the 60 participants will progress on to a two-week ‘training of trainers’ course in October.